For many people, but also scientists, it is only very difficult to understand the functionality of the metal sheets. 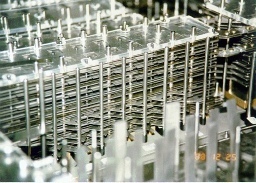 On the right side you can see the metal sheets of the rebuild Z1 It is a view in the floating point arithmetic unit. 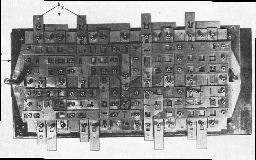 The secont image shows the metal sheets of the original Z1 in 1936. 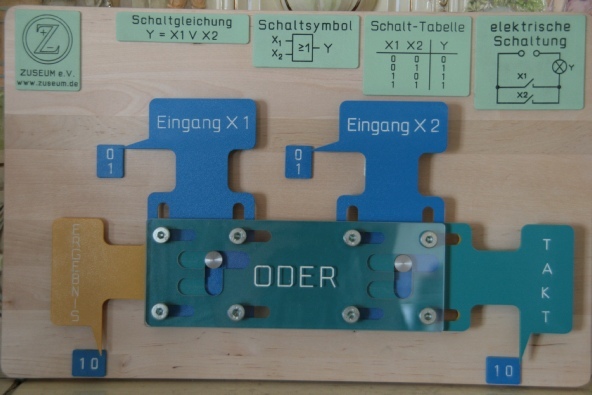 With this item Konrad Zuse tested the functionality of the metal sheets for binary calculations. He checked the Boolean Operation AND, OR and the NEGATION. As you know, the basic ooperations of a computer are the Boolean Operations. With them you can realize the addition etc. The question is: How is it possible to make calculations with metal sheets. The green image right on shows the electrical relization. The switch is on 0 and the lamp is alight, that means 1. 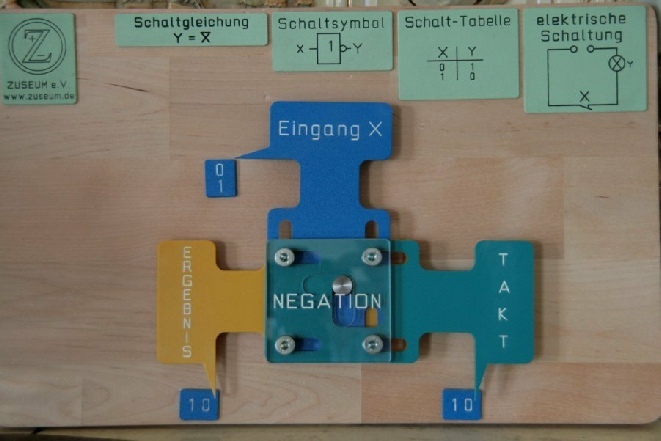 The image left shows the logical table and left from this you can see the logical gate. Above we see the realization of the negation by Konrad Zuse with metal sheets. The model above uses plastic sheets. We have the input X (blue)and the result Y. (orange) The input X can have the two posistions 0 oe 1. The same holds for the result, it also can be 0 or 1. On the right side you see the cycle. The cycle can also be moved from 0 to 1 and back. The input X is set to 0 or 1. The the cycle is moved from 0 to 1 and back. Dependent on the input X the result Y moves from 0 to 1 or remains in the 0 position. The next images below show the functionality of the Negation. Click on the buttons and you can how the negation works. In the same kind as explained above the OR-operation works in the same way.